Website re-design for award-winning lighting designers. 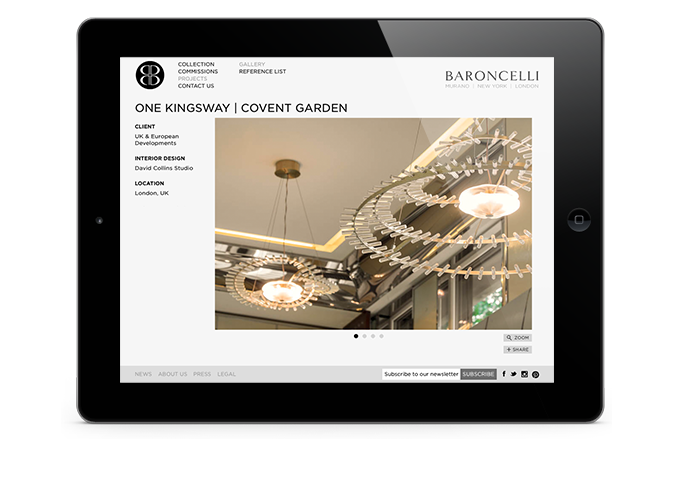 Baroncelli, a purveyor of beautifully-crafted lighting installations, asked us to redesign their website. Continuing a long relationship with the company, during which time eplatforms has helped convey the Baroncelli brand globally, we introduced easier on-site navigation, clearer product photography and new ‘Projects’ and ‘Commissions’ areas for Baroncelli’s collection to make the optimum impact. 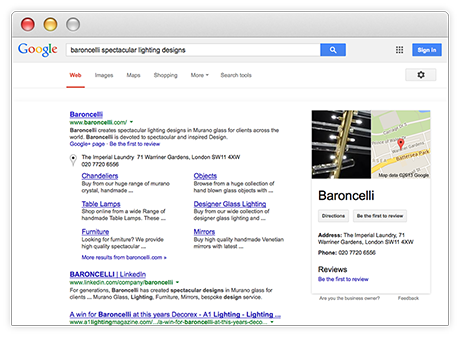 Words and pictures mean nothing if they don’t reach the right people, so we devised and executed a Search Engine Optimisation (SEO) plan to improve visibility in search engines, seriously boosting Baroncelli’s ranking. eplatforms implemented an easy-to-use Content Management System (CMS) for staff to publish web content and press clippings. As a result, content is fresh and consistent with marketing campaigns and new product launches. 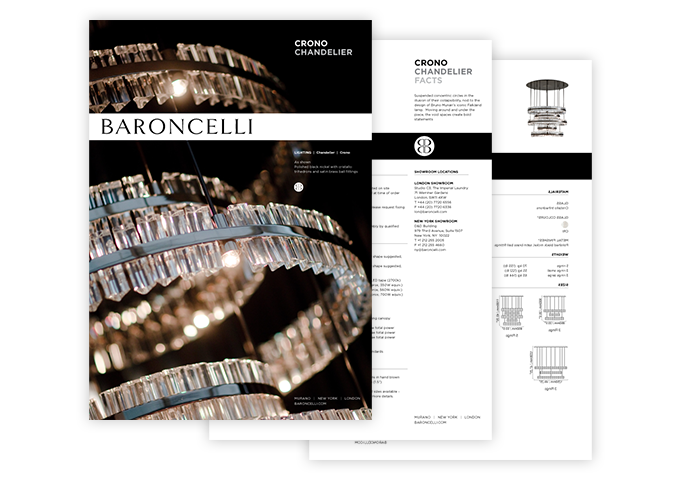 Baroncelli’s international clientele have benefitted from a feature that allows staff to enter prices into the CMS to automatically generate up-to-date PDF price lists in multiple currencies. This has proven especially useful when exhibiting at trade fairs. Baroncelli creates award-winning lighting using traditional Venetian glass-making techniques applied in bold and unexpected designs. With showrooms in London and New York, the company works with international interior designers and architects to create bespoke handmade pieces for private and public spaces worldwide. Baroncelli’s most iconic projects include installations at The Burj Al-Arab in Dubai and Claridge’s in London.